0-1 ft., 1-3 ft., 3-6 ft., 6-12 ft., 12-36 ft., 36-72 ft. Persistent, established, and spreading around old home sites, in suburban woodlands and waste areas (Weakley 2015). Native of Europe. Common throughout NC. What a pretty groundcover. If only it would stay a ground cover, stay where you want it. But no, it spreads. It grows up anything it can find - your house, your shrubbery, your trees. On your house it can pull the pointing from between the bricks. Or it can hold moisture against your wood siding and rot it but quick! 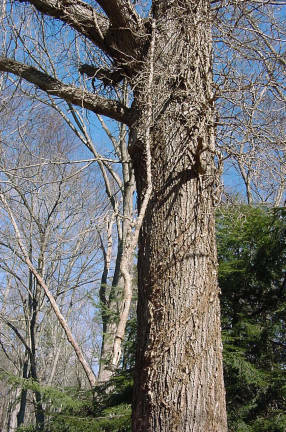 Let it get up your trees, and it changes character from ground cover to an arboreal shrub. 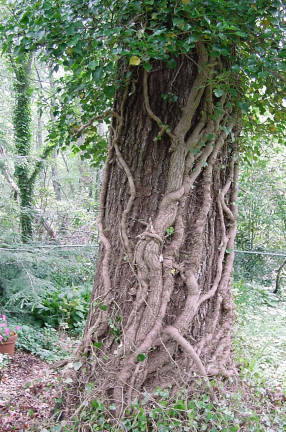 It does not twine around as wisteria, but grows up holding on by hundreds of little "feet". The leaves even change shape from the familiar three points to a smoother, rounder one-point form. 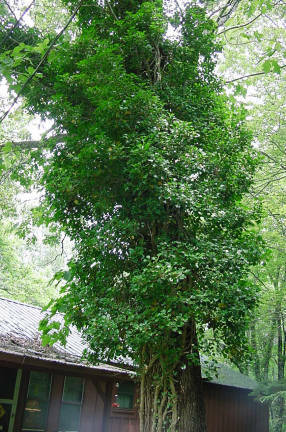 Ivy up a tree sends out runners, yes, and they reach down to the ground where they take root and begin to climb again! It grows out onto the branches of the tree. And it sends out its own heavy branches, with flowers and eventually black seedpods. Such a monster up a tree can make the tree entirely too top heavy. It might just break or fall and then where will it land? 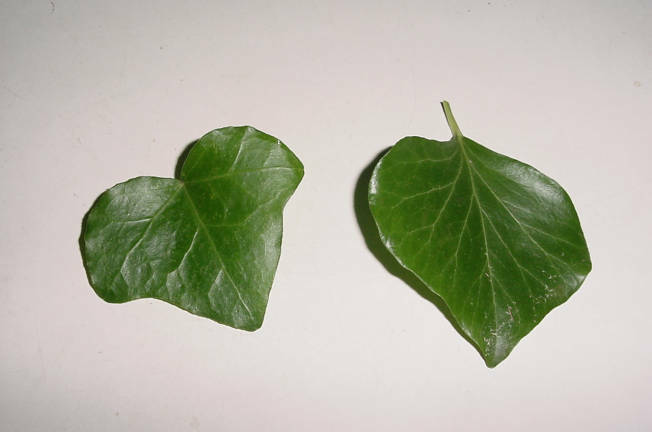 Juvenile and adult leaves have different shapes. Below are pictures of ivy that got away years and years ago. 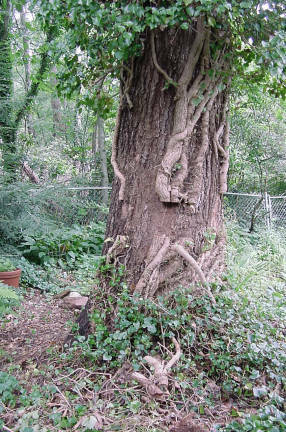 The lower part of the ivy on the tree has been trimmed away, so I could see what kind of job was ahead... the vines running up the tree trunk are, some of them, bigger around than my arm! :( I'm still puzzling how to remove it without damaging or killing the tree. The stems were cut, leaving a foot wide band so that they could not easily grow together again. The Result - After 2 Years! Certainly not pretty, but still encouraging. :) The dead stems are slowly letting go. Really, you do not want to go through this in your garden. 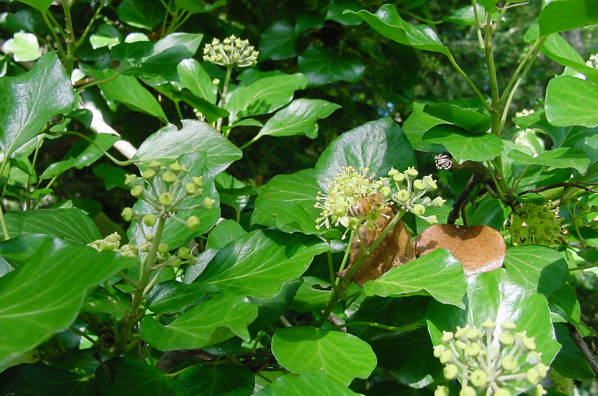 If you have ivy, at least keep it from climbing!